Previously referred to as toxemia, preeclampsia is a medical condition that affects pregnant women. This condition is diagnosed when high blood pressure is present in women who haven’t had high blood pressure prior to pregnancy. For some women, the increased blood pressure can increase to such significant levels that they begin to lose protein through their kidneys. Because of this, Preeclampsia can be diagnosed with a simple urine test, which can identify any increased protein levels in the urine. Most often, women who are five months into their pregnancy or further are at a higher risk for suffering from this condition. Complications from preeclampsia can arise suddenly and rapidly with little or no side effects. Genetics plays a role in the chances of getting the medical condition, but so does body weight and lifestyle choices. The most important thing to remember is to seek the help of an obstetrician or emergency staff if symptoms are severe or do not go away. Preeclampsia can worsen and become a related, but a more dangerous condition called eclampsia. Preeclampsia can often cause an array of side effects including headaches that range from minor to migraine levels. In addition, a pregnant woman with preeclampsia will often stop urinating as frequently as before and ankles and legs may also begin to swell. Babies born to mothers with preeclampsia often weigh less than babies born to mothers without the health condition. Babies can be born with cerebral palsy, epilepsy, learning problems, vision problems and hearing issues. Women with the condition can suffer many side effects including strokes, seizures, heart failure, temporary blindness, liver bleeding, extensive after birth bleeding and water in the lungs. Some women have had placental ruptures that caused their babies to be stillborn. In the worst case scenario, the mother and child can both die. There are several things that can predisposition a woman to having preeclampsia when she becomes pregnant. Most often, the first pregnancy runs the highest risk of complications, especially preeclampsia, but it can occur in successive births. Women who had high blood pressure before getting pregnant are high risk. Mothers who are pregnant with twins or who are obese are more susceptible to the condition. Debilitating health conditions like lupus, kidney disease, rheumatoid arthritis and diabetes can also make pregnant woman contract preeclampsia easier than healthier women. If the mother is over 40 or under 18, she has a higher chance of getting sick with preeclampsia. In addition, studies have shown that women with melatonin deficiency can also have a higher risk of developing preeclampsia. Dizziness, vomiting, diarrhea, weight gain over one or two pounds per week, vision changes and slower reflexes are some of the symptoms that signify that a pregnant woman is suffering from preeclampsia. Auras around everything a woman sees or flashing lights and spots are symptoms of the condition. The vision changes are more noticeable when the pregnant mother is bending up and down, stressed out, after exercise and when standing up. Pain in the upper right area of the stomach is another symptom that can alert pregnant women that something may be wrong. Depending on the severity of the preeclampsia, the doctor can offer several types of treatment. If a woman is already past the 37-week mark, her obstetrician may suggest delivery because it is the only cure for the condition. If she still has a ways to go before delivery, the woman will be put on immediate bed rest at home with medications. She will be told to drink extra water, to lay on her left side the most, to cut out salt from her diet and to see the doctor a few times or more per week. 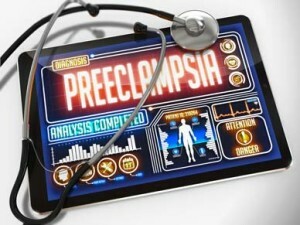 Some women with preeclampsia are in such bad shape that they have to be hospitalized until their baby can be born. Doctors monitor pregnant mothers for fluid intake and output, frequent blood pressure checks and swelling to determine if the mother’s condition changes or gets worse. If needed, women are given steroid shots to help their babies lungs mature faster so the baby can be delivered as soon as possible. Women who are experiencing severe problems with preeclampsia are often given intravenous doses of magnesium sulfate which helps bring blood pressure levels down, prevent seizures and stop labor if it is too soon for delivery. All websites and experts suggest that women who think they are experiencing symptoms of preeclampsia get checked out as soon as they can. If symptoms are severe enough to interrupt daily activities, then it may be wise to seek emergency help. They also tell pregnant women to remember that symptoms can come on suddenly but to be aware of subtle changes in excessive weight gain and a decreased need to urinate. The amount of urine is also something to keep track of when a woman thinks she may have developed preeclampsia.